S509, Cream Color, Exclusive Invitations, Scroll Invitations, Jewish Invitations. Exquisite and Wonderful is what this scroll is all about. This translucent wooly paper scroll comes in a beautiful arc shaped hard cardboard box made up of paisley printed wooly paper. The mailing envelope is also in box pattern. The scroll has silver ends with yellow-silver tassel to tie it. 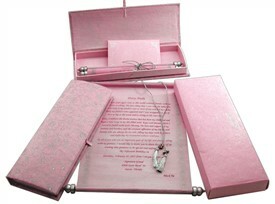 A royal invitation for once in a lifetime occasion! 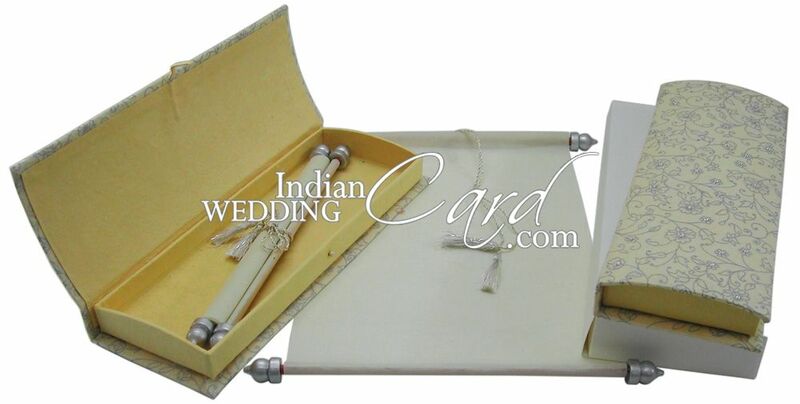 Cardboard box with outer finish in cream color translucent paper printed with silver paisley with white jewels all over with yellow handmade paper lining; Scroll in cream color translucent wooly paper and mailing box in cream shimmery finish card stock.